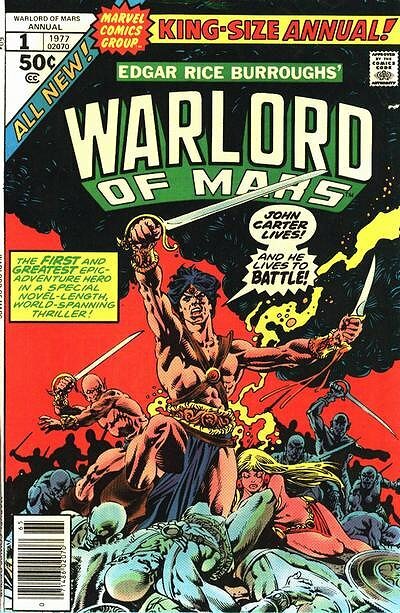 I said we would be returning to Marvel's Barsoom and here we are. The first of three "King-Size" annuals tells us the tale of "When Walk the Ancient Dead!" If this sounds familiar its because it's (as the credits state) "loosely" based on the opening story from Llana of Gathol with some modifications, primarily no jetan game between Carter and Pan Dan Chee and no appearance by Llana. That said Marv Wolfman stays pretty close to the original, somber tale with some modifications to make it fit into then current timeline Marvel had set for John Carter. There is still enough action and surprises to make it a worthwhile read even if you are familiar with the original tale. Helping out is the artwork by Sal Buscema and Ernie Chan that captures the faded glory of Horz while managing to bring giant ulsios, beuatiful princesses and rousing action to life. Granted Pan Dan Chee looks like he escaped from Marvel's Savage Land (seriously he looks like Ka-Zar's cousin) and the green men aren't as menacing as they could be but that's small change for a great looking tale. One down and two to go. Until then take care and Kaor!